150 Corolla and 25 odd Camry from over 100 Dealers across the country, perhaps a small town in the US will be selling more. Don't know what the guys heading this business smoke, perhaps Toyota is too big and Indian market too small that someone higher up will even notice. Both models are CKD and most of the components come from Thailand or localised and still, they can't find a price point. I am sure they can sell 10 X numbers with Zero efforts if they can price this competitively and they will earn more profits due to larger numbers. But these guys see profit/car than anything else. Maybe Maruti is different due to the direct involvement of Mr Suzuki/ family. Last edited by Turbanator : 8th January 2017 at 10:50. Thanks Aditya for the update on Dec-16 analysis. 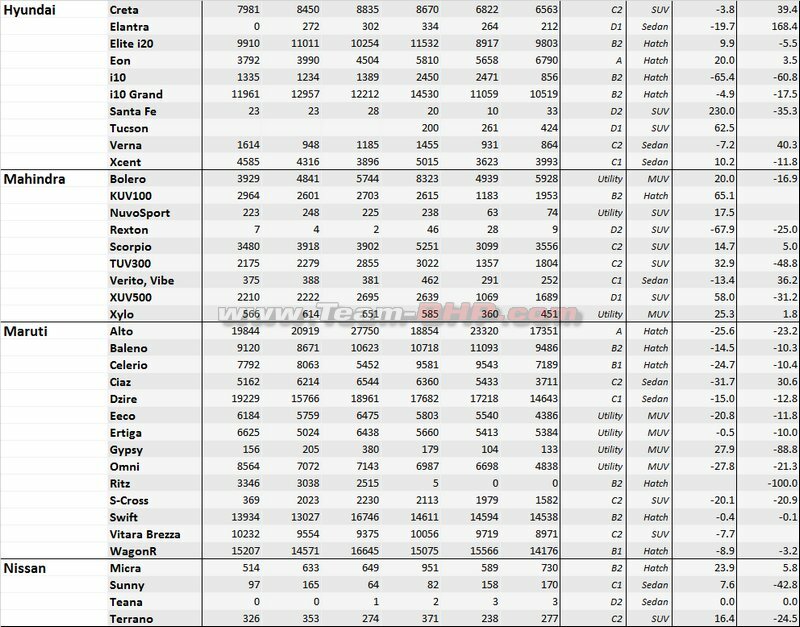 •	Maruti Suzuki’s dominance continues closing at a market share of 48% in 2016 and dominating with 11 out of the top 25 bestsellers in December -16 dispatches.. Vitara Brezza and Baleno are the new find for MS with the known soon to be released cars the figures are expected to repeat in 2017. •	Hyndai the undisputed and traditional second runner helped in volumes garnered by Creta, Grand i10 and Elite have contributed in guarding its 2nd position. The Elantra and the Tucson are both off to a good start in the premium segment. •	Mahindra’s had a good run in 2016 and comes third in the chart. With a predominantly diesel only UV portfolio it is commendable for them to reach this position. But the problem is how can they retain this in 2017? TUV, KUV losing its steam at a fast pace and the situation could worsen as new launches from competition is expected to erode this share. •	Honda comes next but with a negative growth. 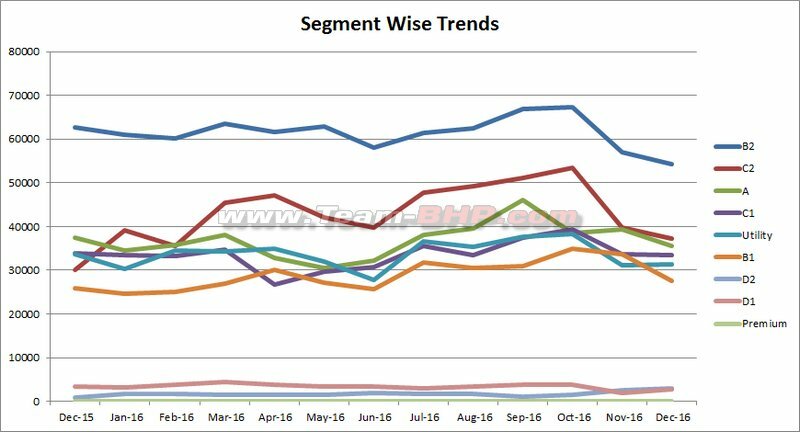 A very bad year for Honda in all segments and most hit is losing the traditional C segment spot to Maruti Suzuki’s Ciaz. The 2016 BR-V proved to be a dud, along with Brio and Mobilio. Jazz and Amaze have contributed to Honda India but not consistent in numbers. Hope with its upcoming Honda City’s face-lift and its Cuv WR-V (not much of hope though! )Honda could bring some respectable numbers in 2017. •	2016 clearly belongs to TATA Motors. 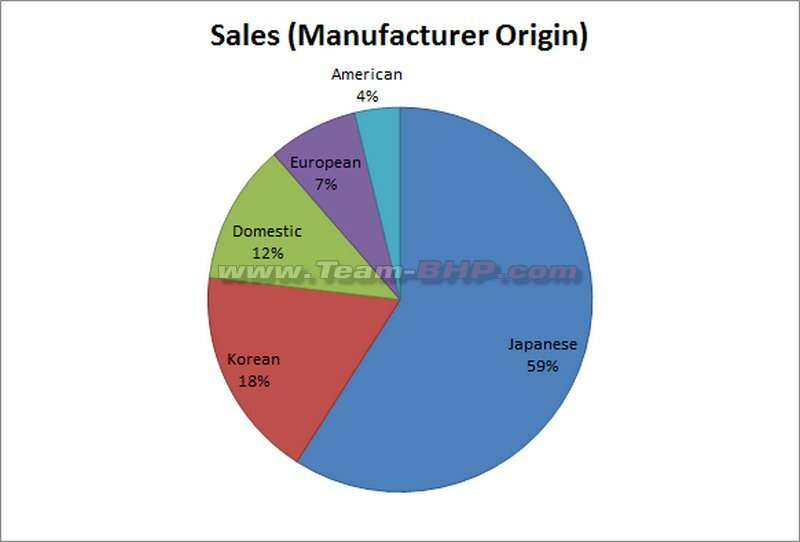 Comes in 5th place in 2016 sales beating Toyota. Tiago’s success should be capitalized and new launches should drive growth. 2017 will be testing time for TATA’s with 3 hyped launches slated but the key point is when? •	Toyota though not in the top 5 should be very pleased in way the Crysta and Fortuner numbers are shaping up. This is the power of Toyota as a brand! In the LUXURY segment, Mercedes-Benz continued to rule the roost ahead of fellow German rivals, Audi and BMW. 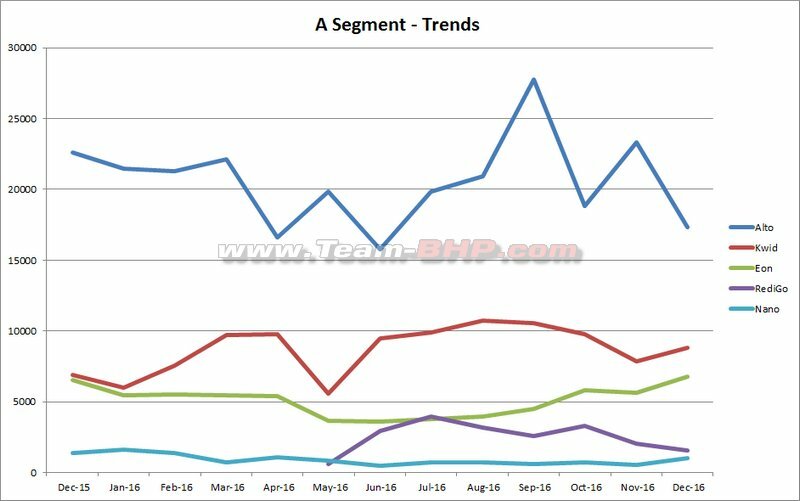 The hard hit segment due to the ‘demonetization effect’ it is interesting to see how this segment gets back in terms of volumes in 2017! Last edited by volkman10 : 8th January 2017 at 11:07. Ford is like a mixed bag. All of a sudden the Ecosport sees a massive dip in numbers. On the other hand the Aspire is holding steady. The Endeavour took a massive jump in numbers. Could it be that buyers were waiting for the Fortuner to launch and after seeing the premium pricing, they went towards the Ford. Ofcourse this is only a small % of buyers as the Fortuner sold double of the Endeavour anyways. Honda desperately needs to get it's act together. Looks like they are manufacturing BR-V's every alternate month and are rotating the manufacture to optimize the production lines. City getting trounced by Ciaz. Hopefully the facelift improves that. They need to do some soul searching. Why not get the Jazz with a 1.5L City engine with MT and CVT and spice up the segment? Atleast try a different line with a JAzz sports. Hyundai can do no wrong. The Creta is rock solid even in December! The Tucson even at that price point and FWD managed 400 units! Elantra top of the D1 segment even above corolla. Toyota is set with the Fortuner and Innova bringing in the numbers and the moolah. They really don't need to worry about the lower segment. Only the Corolla needs to be refreshed now being 3 years in the market without a single update. 1) Read somewhere that Maruti had its best retail month. In any case, they are standing tall after conquering C2 segment, a segment where Maruti was playing catch-up. Baleno is quite VFM for the features they are offering, it makes the upcoming Ignis lower variants look not so good, just like Vitara Brezza wherein only top variants are heavily loaded. What they need further : A 1.5-1.6 capable petrol, just like the one they have in 1.2 ltr., and a similarly capably diesel. A 1.3 and 1.5 diesel would be icing on the cake. Largest Mass market petrol engine by Maruti is K14B and best selling diesel engine in Maruti is Fiat SDE, yet the way Maruti is commanding market makes for a case study in itself IMO. In future the lack of newer or powerful diesel and larger capacity petrol (1.5-1.6) can turn out to be a difficult proposition for Maruti. Hope I am not too skeptical. But we can have pleasant surprises from them, just my expectation. 2) Hyundai. 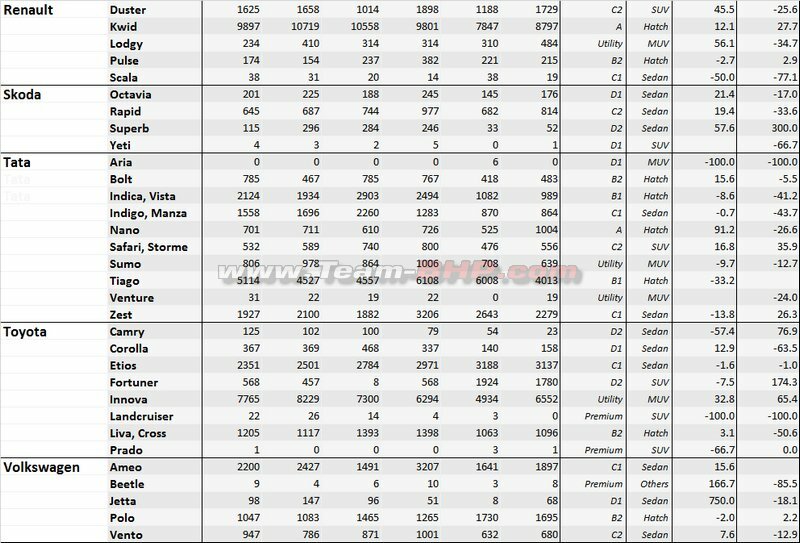 Creta sales not keeping up as high as earlier numbers is a surprise, Verna is lost in oblivion. Elantra is selling more than Corolla, Octavia. Tucson at 424 units is a real surprise. Its performance has to be observed for a few more months. But their strategy isn't wrong with Tucson. 3) Toyota has to rethink its pricing. Toyota Corolla is behind Octavia and segment leader seems to be Elantra. Corolla diesel costs too much for such a puny engine for its segment. But as long as Innova and Fortuner sell, they wont care. Liva and Etios platinum now cost much more and that feel good factor once inside the cabin is missing. Vios if at all its hitting our shores, shall still be quite a while away. Pricing Vios like the way they have done with Corolla wont help. Its evident that Toyota could not take Maruti, Hyundai head on under Rs. 10 lakh segment. 4) Ford. Figo: A very capable product losing out. With that diesel motor, I expected it to sell more. Aspire soldiers on, Endeavor holding up its own against Fortuner (the Brand Toyota is heftier than the product itself IMO for Endy vs T-Fort). Ecosport clearly lost the battle with mighty Maruti (Vitara Brezza). 5) Honda. What a struggle, and similar mistakes like Toyota in mass market segments. Even Jazz is fizzling out with BRV and Jazz posting similar figures. City facelift with a price rise would be a tough task after initial Euphoria. 6) Chevrolet. I honestly feel that Tavera has potential. The demand for robust Body on Frame vehicles is there. Chevrolet should have put in efforts into Tavera rather than Beat Activ. I know its not easy, but a detuned 2.0 ( eliminate the lag ) from Cruze along with safety features can extend life of Tavera. With current discounts, I feel its more VFM than ever : A robust chassis, suspension, low maintenance powertrain ( lacks grunt once road opens up but has low end torque typical of a large diesel ), good space is a formula having its own space in crowded market. 7) Mahinda : Losing steam, rethink and evaluate whats happening to avoid situation like Tata in passenger car segment. One of the oldest ( and dare I say, agricultural ) product i.e. Bolero is their best seller, and premium products like XUV500 sales are getting into troughs. Have a rethink of pricing across Scorpio and XUV500 range to optimze and try to play the value card the way XUV500 did earlier. 8) Tata : Tiago is a well deserved success, dont get too greedy with pricing. Its a product in very value conscious segment. Smartly price Hexa, it has potential to take the fight and make an impact on XUV if it undercuts XUV. The Aria blues should make its presence felt while charting out pricing strategy of Hexa. Fiat : Disaster. Tucson sold more than combined sales of Fiat. Datsun : Slowing down. Redigo could not do a Kwid for Datsun. Nissan : Try reducing price of Sunny and work on service network, that product has much more potential. VW/Skoda : Octy had a good month. I dont see their market share going up in near future. Last edited by aaggoswami : 8th January 2017 at 12:10. Renault has gained stable volumes. I think when they bring their new cars like Kaptur to India they will only become stronger. Skoda Rapid's new update looks promising but the numbers are not showing any significant jump. Baleno and i20 were fighting the top slot in the segment with i20 missing it couple of times this year. Now in 2017 we need to watch out how both of them play it out. Nano touching a 4-digit volume after a long time. Is Tiago pull helping distribution? Hyundai Elantra and Tuscon's entry in their segments makes it look very easy for them. Sales numbers of the top 10 best sellers of 2016. Except for the Kwid, rest all are from the Maruti and Hyundai stables. Revenue Calculation have been done for this month and have been posted here. 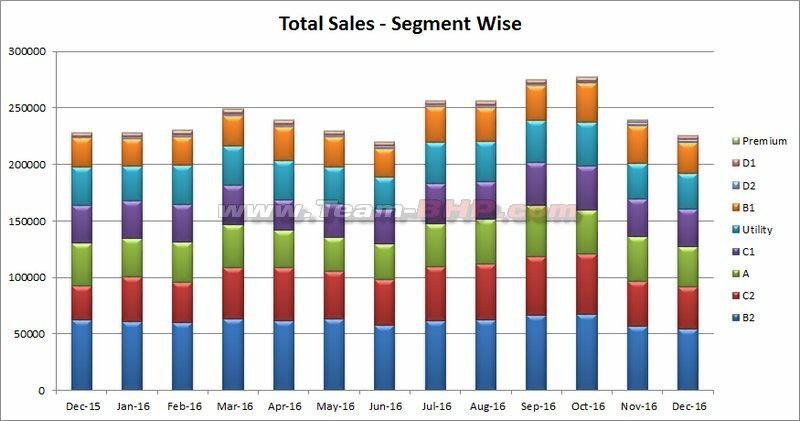 2016 sales of some popular models. Maruti Ciaz has decisively taken the crown from the City. Tiago has consistently improved its numbers over the year. Hope to see it in the top 10 next year. Eeco and Omni, even though bare basic, are selling in good numbers. Maybe the bare basic nature is their selling point. Last edited by deerhunter : 8th January 2017 at 15:13. Thanks Aditya for the much awaited sales numbers for the month of Dec '16. 1. This is the 2nd lowest volume month in 2016, for the car industry as a whole, except for Jun '16 when Maruti's sales dip due to fire, has pulled down the numbers. 2. Maruti Suzuki ended the year how they begin, with 1,06,388 units in Dec vs 1,06,383 units in Jan.
3. Tiago has lost almost 2K units this month thus pulling down Tata from 3rd position in last month to 6th position - goes to show how Tata banks on Tiago. Hope their upcoming launches like Hexa, Kite 5 Sedan and Nexon are able to change that. 4. Alto has fallen significantly - 6K, compared to last month, whereas Eon had the best selling month of 2016. Redi-Go has seemed to be going down with every passing month. 5. Indica & Indigo has been steadily losing steam since the cabbies have more number of options to choose from now. i10 has hit the lowest in its history - time for Hyundai to pull the plug on this little hatch. 6. Swift has regained its 3rd spot from Wagon-R and i20 regained its top spot from Baleno in Premium hatch segment. I thought Figo cannot go down any further than last month, but they proved me wrong. 7. Dzire has hit its lowest month this year, with 14,643 units, but still managed to outsell the all the other 5 Compact Sedans combined together (Xcent, Amaze, Aspire, Zest, Ameo) with 14,204 units. 8. Ciaz, despite having lower volume than last month, managed to hold off City - hope the facelift brings in much needed impulse for Honda, but they have to price it judiciously against Ciaz. 9. Verna's sales are lowest in its history - what a fall for once a segment leader. Rapid once again managed to outsell its sibling Vento. 10. This is the lowest month in 2016 for Creta and Ecosport, the latter's numbers have almost halved - wonder what happened there. 11. On the other hand, Endeavor recorded its lifetime high even while Fortuner has sold almost double than the Ford - goes to show how much Toyota's brand pulling power. 12. Elantra managed to keep the top spot, with Corollan relegated to 3rd position once again this month. Tucson too has a mind boggling month, but have to wait and watch the trends next year. I afraid I'll be not be able to sleep tonight if I don't know how or why Aria sold 6 units last month. Demonetization deal? That too we are on the verge of Hexa being launched. Strange things happen but this one is just out of the world. Btw keenly waiting for Hexas pricing. Toyota sells 10% of the market leader Maruti. This could be the only market Toyota does so badly. Top 10 sellers are all new gen models except WagonR. Last edited by sgmuser : 8th January 2017 at 16:24.